The name ‘Itako’ reminds the Japanese over certain age of a song, “Itako-gasa”, a best hit song of Yukio HashiW in 1960. Unfortunately, we were not yet born at that time but it is so famous that we have heard it and we are very familiar with it. As we are sure that no non-Japanese people know that song, with an exception of very rare cases, we have put the YouTube site below for you. The very first phrase, the most famous part, which even we who don’t know the whole song can sing, is the name of a guy, “Itaro”. Cronical hats of Itako. Photo from ‘Discover Ibarakii‘, an Official Site by Ibaraki Prefectural Government. So, Itako-no-Itaro means “Itaro” of Itako. Itaro is a vagabond, a tramp, who left his girl friend in Itako. He recalls her sometimes, away from hometown. She might be working in fields with a conical hat on, the hat which people of the area wear when they work outside. There is another song very famous called “Itako hanayome-san”, which means a bride of Itako. This is also a very old song of 1960. We have never heard this song on TV but we remember that our parents or grandparents hummed it. Check the song in You Tube below! This is a song of a bride who goes to a groom’s house for wedding on a boat. Itako was a town of a river and canals, which were implemented in the early Edo periodW for the flood prevention projects. Because so, the household goods and bride herself were carried on boats through canals until late 1950’s. 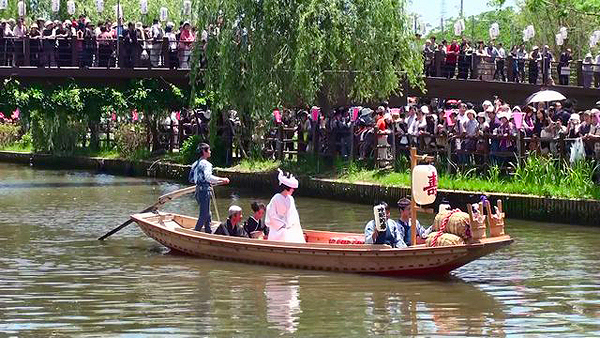 A nuptial procession, or a wedding parade by traditional boat in Itako. Photo from ‘Nobu-san no digi-came Sampo‘. Beautiful purple Ayame in bloom by the canal of Itako. One of the traditional Japanese scene of May. 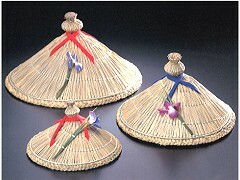 When the Ayame Festival is held in Itako, they revive this old custom. This year’s Ayame Festival will be held from 24 May (Sat) to 29 June (Sun). 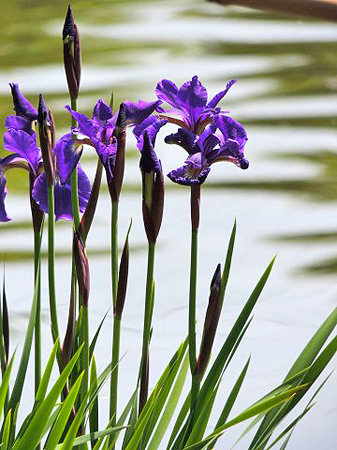 It would be great if you could visit Itako if you are in Japan in this period and see the beautiful Ayame, the Iris (plant)W, (** ‘Iris sanguinea’ to be precise) blooming between the waters and see the rare traditional wedding parade. 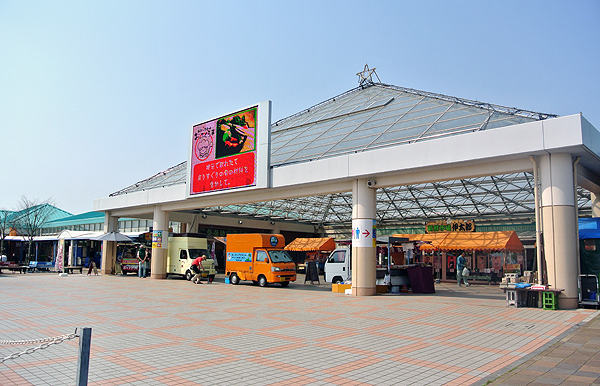 Michi-no-Eki Itako is situated very close to Itako IC of Higashi-Kantō ExpresswayW, which passes Makuhari of Makuhari Messe and Narita International Airport. If you are planning to go to Ooarai Beach for Shiohi-gari, Ooarai Aqua World – one of the biggest aquarium in Japan, Kashima ShrineW, or Kashima Stadium, by car, it is a recommended spot for a short break. The main building of Michi-no-Eki ‘Itako. 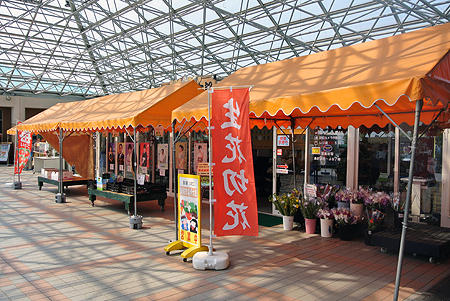 Hamaguri Stall within the site. Live and cooked Hamaguri can be bought here. Within the site, there is a market called ‘Itaro / 伊太郎’ where they sell fresh vegetables which local farmers provide every morning. 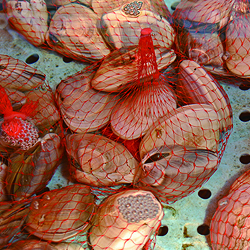 Depending on the season, they sell HamaguriW , the big clams. 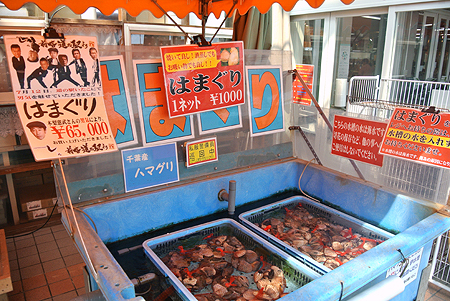 Fresh Hamaguri sold in a net. It would be a relief, maybe, for those of you who couldn’t make a good progress on Shiohi-gari as you can buy some clams and bring them back home with you! Okamoto’s ‘Maboroshi-no Cream Pie’ for those who love cream puffs! There is also a snack bar, ‘Niji Kobo / 虹工房’, where you can get ice cream, yogurt, interesting traditional sweets, onigiri (rice balls) and many others. 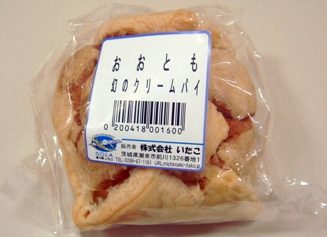 幻のクリームパイ”, which literally means, phantasmal or fairy cream pie, we recommend you to get some if you love cream puffs. The name given to this sweet gives us the image of difficulties in buying them but there isn’t! It should be there unless sold. In a small restaurant, “Ohukuro-tei / おふくろ亭’, you can feed yourself with very ordinary Japanese dishes as if you eat at your Japanese friends’ home. Apart from food, there are also cut flowers herbs and flower in pots sold grown in this area for you to take home. Cut flowers and pot plants sold as well as fresh vegetables of the land. Address : 1326-1 Maekawa, Itako-shi, Ibaraki Pref.